The HubSpot and Shopify integration is designed to bridge the gap between your ecommerce activities and marketing efforts. Please note: if you have the HubSpot-Salesforce integration enabled, you cannot currently use the Shopify integration. You can connect one or more of your Shopify stores to HubSpot. Each connected Shopify store will have an ecommerce settings page, with its own set of embedded ecommerce workflows (Marketing Hub and Sales Hub Professional and Enterprise accounts only). In your HubSpot account, click your account name in the top right corner, then click Integrations. In the upper right, click Connect an app. Use the search bar to search for the Shopify integration. Hover over it and click View integration. In the dialog box, enter your Store's Shopify URL and click Connect to Shopify. In the pop-up window, enter your Shopify credentials and click Log in. You'll return to HubSpot and see a dialog box indicating your Shopify store has been connected to HubSpot. Once you integrate HubSpot and Shopify, the connector will automatically add your HubSpot tracking code to all of your Shopify store pages. Check the progress of the import or modify your sync settings by clicking Go to ecommerce settings. Once your first store is connected, you can connect additional Shopify stores from the Shopify integration page. In the upper right, click the dropdown menu and select + Connect another store. To switch between stores, use the dropdown menu in the upper right. The contact, deal, and product property Source store can be used to identify any connected Shopify stores that have synced with the object, and allows you to report, filter, and view data from individual stores, or all your connected stores at once. After the initial import of your Shopify data is complete, you'll be able to see your Shopify Products, Customers, and Orders in HubSpot. Contacts: Shopify customers sync with HubSpot contacts, and are deduplicated by email address. If a contact does not exist with the same email address in HubSpot, a new contact will be created as long as the Shopify customer was created with an email address. If a HubSpot contact already exists with the same email address, Shopify will update the contact as long as a value exists for the property in Shopify (i.e., the property is not blank). Please note: a Shopify order with an associated customer that was not created with an email address will sync over to HubSpot as a deal without an associated contact. 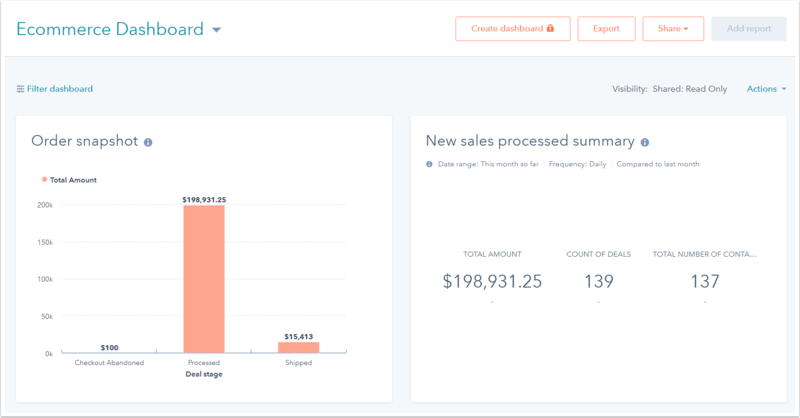 After your Shopify store(s) is connected to HubSpot, an Ecommerce Dashboard will be added to your account. Navigate to your HubSpot dashboards by clicking the sprocket icon sprocket in the top left corner of your account. In the top left, click Marketing Dashboard, then select Ecommerce Dashboard. Hover over an existing report and click the Actions dropdown menu, then select Edit. Customize your report by editing the Filters, Measures, Visualization, and Data as needed. After you've made your changes, click Update on dashboard. This report in your dashboard will be updated to reflect your changes. Please note: default dashboard reports are updated over time by HubSpot. After a default report has been customized on your dashboard, it won't be updated to show the changes to the default report. You can add the latest version of any default report to your dashboard by clicking Add report and browsing the Ecommerce reports in the left sidebar menu. Use line item properties to segment your HubSpot contacts by the name of their product, along with the deal stage in the Ecommerce pipeline that corresponds with their order status. For example, you can create lists to segment contacts who are in the midst of purchasing or have purchased a specific product, to target them in workflows to nurture them or upsell to them. In your HubSpot account, navigate to Contacts > Lists. In the upper right, click New list. In the left panel, select Line item properties and search for and select the Name property. Select is equal to any of or contains any of, then enter the product name in the field and click Create option. You can further segment contacts by the order status associated with the product. Click and below the first filter, then click the dropdown menu and search for and select Deal stage. Select is any of, then click the field and select a deal stage. In the top left, click Name list and enter a name, and choose if the list is Active or Static. To create the list, click Save. With the Shopify data that's synced to HubSpot, you can run automated ecommerce campaigns to supplement your customers' ecommerce activities. [Deal workflow] New customer workflow: welcome new customers with a series of friendly welcome emails (Sales Hub Professional and Enterprise only). [Deal workflow] Abandon cart workflow: remind contacts to place their order after they navigate away from a full cart (Sales Hub Professional and Enterprise only). [Contact workflow] Re-engagement workflow: re-engage people who have bought something in the past, but haven’t been back in a while (Marketing Hub Professional and Enterprise only). The default ecommerce workflow emails use ecommerce email templates. These templates include custom, deal-specific modules, and can be modified in the design manager like any other content template. At this time, deal personalization is limited to email templates that are created or selected for the Abandoned Cart Recovery ecommerce workflow. The New customer and Abandon cart deal workflows only require a Sales Hub Professional or Enterprise subscription, but the ability to send emails in those workflows requires a paid Marketing Hub subscription. Marketing Hub Professional and Enterprise accounts which have currently or previously activated the New customer or Abandon cart workflow prior to January 22, 2019 will have legacy access to those two workflows, along with deal-based workflows. In the right panel, select an action to add to the workflow. The Recommended section displays actions which are recommended for that workflow. To view more actions, click See more. After selecting and setting up an action, click Save. To add another action to the workflow, click the plus + icon. When you're done, click Click here to review and turn on. You'll be redirected to the workflow in the workflows tool. In the upper right, click Review. Review the workflow settings, then click Turn on. Please note: the enrollment triggers of the default ecommerce workflows cannot be modified. The Welcome new customers workflow is triggered by a contact's first purchase, the Follow up on abandoned carts workflow is triggered when a contact abandons a cart, and the Re-engage with old customers workflow is triggered when a contact hasn't purchased in x days. If you want an ecommerce workflow to have different enrollment triggers, clone the workflow and modify the enrollment triggers in the cloned workflow. Will contacts synced over from Shopify be tracked in HubSpot? Contacts that are created in HubSpot as part of the initial import from Shopify when the integration is first set up will have an Original source drill-down 1 value of API and an Original source drill-down 2 value of integrations-sync. These contacts will not be cookied, and have to convert on a HubSpot form or click through a HubSpot marketing email sent from your portal to a page that has your HubSpot tracking code before they can be tracked in HubSpot. Contacts that are synced over and created in HubSpot after the Shopify integration is set up will have Original source drill-down 1 and Original source drill-down 2 values based on their original source type as determined by Shopify. These contacts will be cookied and will be tracked in HubSpot as soon as they sync over from Shopify. Do I need to add the HubSpot tracking code to my Shopify store pages? No. Once you integrate HubSpot and Shopify, the connector will automatically add your HubSpot tracking code to all of your Shopify store pages. What happens if I delete my Shopify product/customer/order? When you delete deals and products in Shopify, the corresponding deals and products in HubSpot will be deleted. When you delete customer records in Shopify, the corresponding contacts will not be deleted in HubSpot. What happens if I delete my HubSpot contact records that were created via Shopify? When contacts in HubSpot that were created via Shopify are deleted, the corresponding customer records will not be deleted in Shopify. However, these contacts will not be re-created if their records are updated in Shopify. How does HubSpot determine when an order has been abandoned at checkout? An order will have a deal stage of Checkout Abandoned in HubSpot if the Shopify order is created and not completed within 24 hours. After 24 hours pass, the order will move from Checkout Pending to Checkout Abandoned. Can I use HubSpot to send Shopify invoice emails? At this time, it's not possible to use HubSpot to send Shopify invoice emails or other transactional emails for completed Shopify purchases. The Shopify integration is designed to conduct marketing activities for ecommerce in HubSpot and keep transactional activities in Shopify. Can I use third-party Shopify integrations with the HubSpot-Shopify integration? Yes. However, if the third-party integrator creates deal records for orders, having both integrations can create duplicate deal records. The deal records created by the HubSpot-Shopify integration can be identified by the deal property EComm Synced.